Recorded live stream sessions can be accessed here. In parallel to the [email protected], a workshop on MOOCs was conducted by IFITT representative Prof. Jamie Murphy, at Calamander Unawatuna Beach Resort, in the southern region of Sri Lanka on the 15th of October. Perhaps this is the world’s first MOOC workshop which is conducted at a Hotel. The hotel staff was delighted to gain new knowledge on MOOCs and the role MOOCs can play education and training for hotel staff was identified. Ms. Paloma Scott, Director of the Calamander Unawatuna Beach Hotel, Mr. Udana Wickremasinghe, Director of ICT for Sri Lanka Tourism Development Authority were also present. The [email protected], under the theme of “Modern ICT interactive Tourism Learning and Education” was held on 18th October at the main library auditorium of the University of Colombo (UOC). 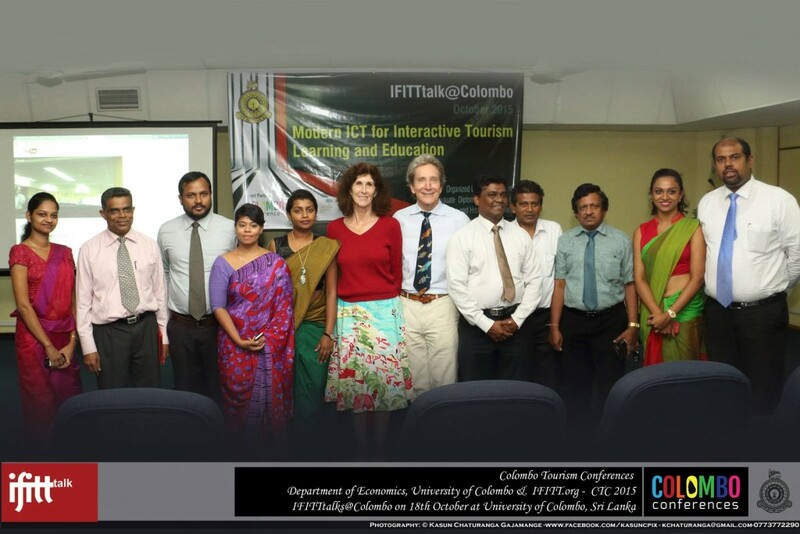 The seminar is organized conjointly by the IFITT and students who are following the Postgraduate diploma and master’s degree in Tourism Economics and Hotel management of the Department of Economics at the University of Colombo. This is the 2nd edition of IFITTtalk series which held at different locations in the world. More than 150 participants who are interested in etourism from various divisions of hospitality & travel sector were present. The [email protected] was conducted with the view of giving more insights to the people who are employed and engaged in travel and hospitality industry. Impact of the ICT on tourism industry, application of ICT in interactive tourism education, information on world’s reputed MOOCs in the related field, and current E-Tourism application for the promotion and development of the tourism field was discussed at the seminar. During the afternoon session, Dr. Rohantha Athukorala, Former Chairman of the Sri Lanka Tourism Promotions Bureau and Commissioner General of EXPO 2015 spoke on “Role of ICT for Tourism Promotion” and Mr. Ruwindhu Peris, Managing Director of STAX Inc. delivered his speech on ”ICT and Business Intelligence”. Following the industry speakers, two students from the Masters in Tourism Economics and Hotel Management program of Department of Economics, University of Colombo, Mr. Dileepa Siriwardene spoke on “Social media Marketing in Promoting Hotel Industry in Sri Lanka”, and Mr. Sisitha Weerasekare on “Impact of Etourism on Travel Agency Operations in Sri Lanka”. The event was concluded after a networking & evening snacks & refreshment break.